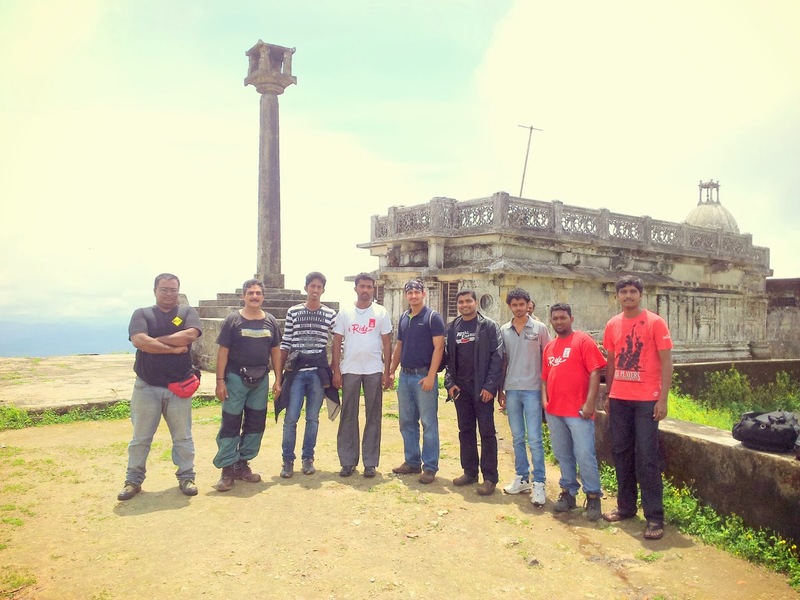 ASHOK PARIMOO'S TRAVEL BLOG: URU CLUB'S RIDE TO "JOGIGUNDI" & "KUNDRADRI BETTA"
URU CLUB'S RIDE TO "JOGIGUNDI" & "KUNDRADRI BETTA"
On Sunday, 15th of September-2013, at the crack of the dawn, I; (ASHOK PARIMOO), suddenly woke up and checked my wrist watch, it was showing 5:50 AM. I peeped out of my window and found that the streets around my area, (“Indrali-Udupi”), were dark and deserted, except for couple of rain soaked stray dogs, who were barking occasionally at the newspaper and milk-packets, delivery boys, who were cycling and were donned in scanty rain jackets and rain caps, braving the cold rain and chilling winds, just to deliver the morning daily newspaper and milk-packets, to the prefixed delivery residences In my heart, I really salute these delivery boys, who because of their family financial poverty and hardship, put themselves to all sorts of physically painful hard work, just to earn extra money to support their poor families. My Jai-Ho to these sincere hard working guys. 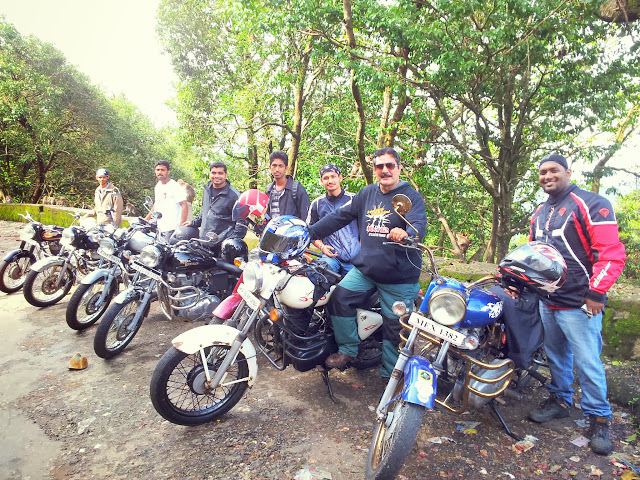 I; (ASHOK PARIMOO), woke up so early because may be I was excited to lead our United Riders Udupi (URU) club riders to the lesser known “Jogi Gundi waterfall”. Since waiting at home from 5:30 AM for it to 7:15 AM, it was slowly killing my patience. So I decided to go and wait at Tiger Circle, Manipal itself, where I could at least refresh myself with a big cup of piping hot coffee. 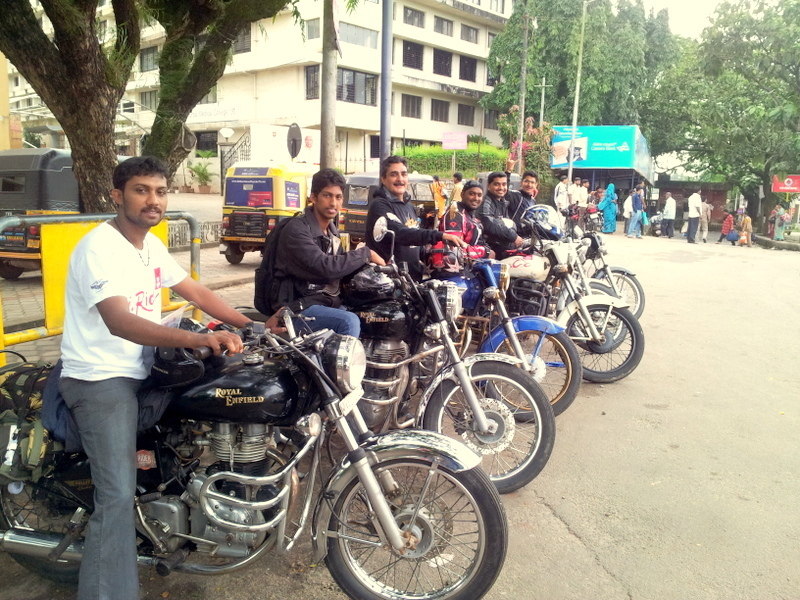 At 7 AM, I was relieved to hear a Royal Enfield motor bike’s powerful thumping sound that was coming towards me. It was VINFY, one of our URU club members. Within another 20 minutes, there comes PRASAD, UDIT AGNIHOTERY, AJITH SHET, STEPHAN and SAILESH. 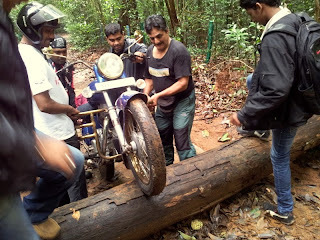 As PRASAD was not well, he just came to flag-off our ride and wished us safe journey and went back home. 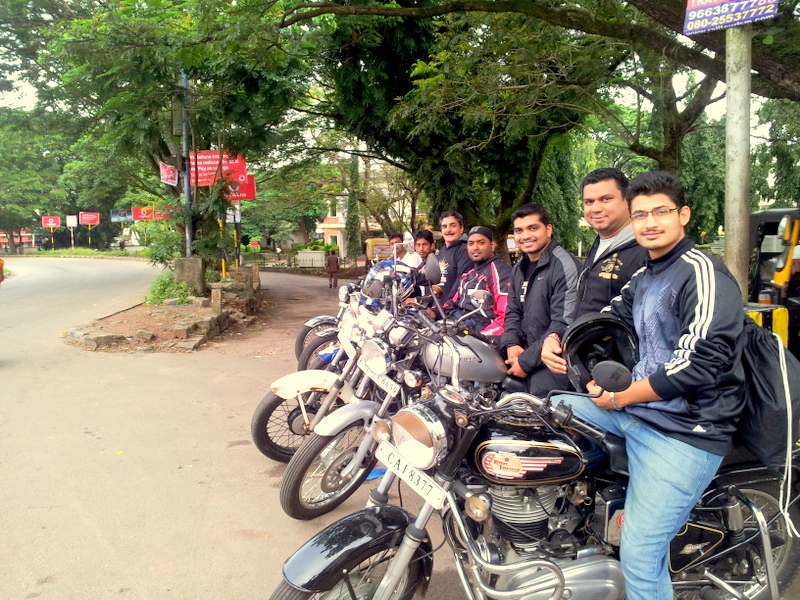 After finishing our breakfast, we rode through Agumbe Ghat road, which is very narrow and has very steep gradient. 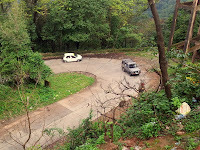 On this narrow Ghat road, other than many ordinary turns and curves, it has dangerous and very steep, sharp 14 Hair-Pin curves also. 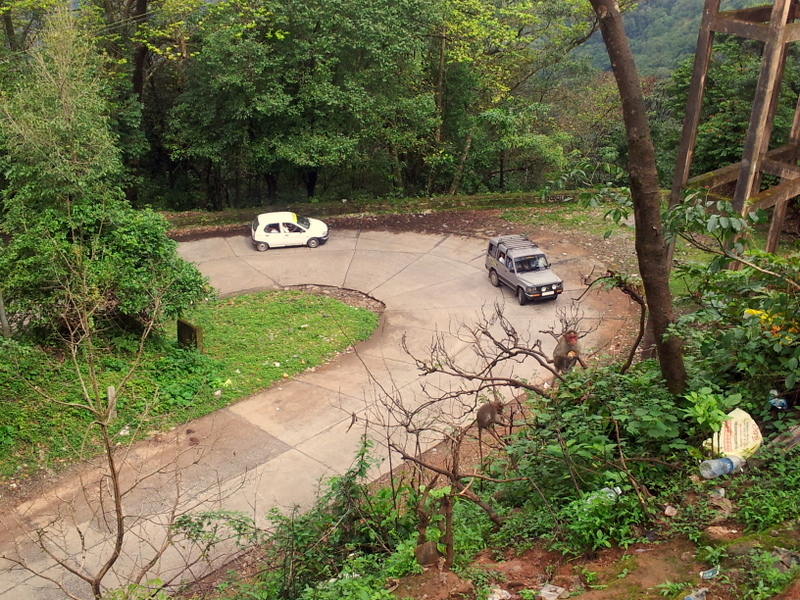 This road shares two districts, first 7 Hair-Pin bends are in Udupi district and reaming 7 are in Shimoga district. Because of being narrow Ghat road, only light SUV’s, Minni-buses and motorbikes ply on this road. At the end of the 14th Hair-Pin curve, we parked our motorbikes, adjacent to a RCC platform structure called as “Sun-Set-View-Piont” From this platform you get to view the most magnificent and breathtaking panoramic bird’s eye view of western Ghat. Deep down in the endless valley, you get to view different shades of lush greens of thick dense forest, freshly cultivated paddy fields, stretches of coconut as well as rubber plantations, brooks and small rivulets. On a clear sunny day,from this “Sun-Set" view platform, we get to view even sun-set in the Arabian sea. The view of the whole surrounding valley is a feast to eyes, mind, body and soul. At the platform, at any time of the day, there is always a nip in the air and chill breeze blow against our faces. 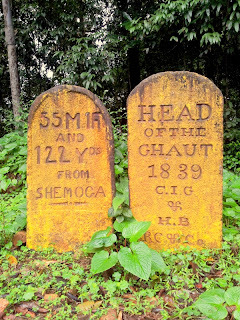 This Agumbe motorable road must have been constructed by Britishers in 1839, the proof of which is engraved on a mile stone, that is fixed at a turning after crossing the forest check point. From Agumbe Ghat-top, straight we rode to Agumbe village. 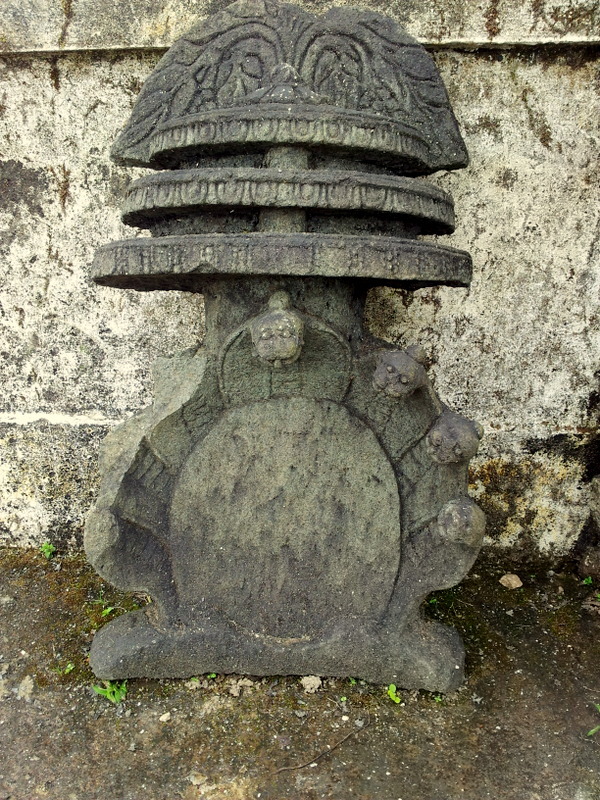 Agumbe is a small hamlet which is known as the "Chirapunji of the South India". 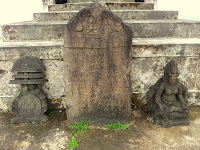 It is one of the places which receives the heaviest rainfall in south India. 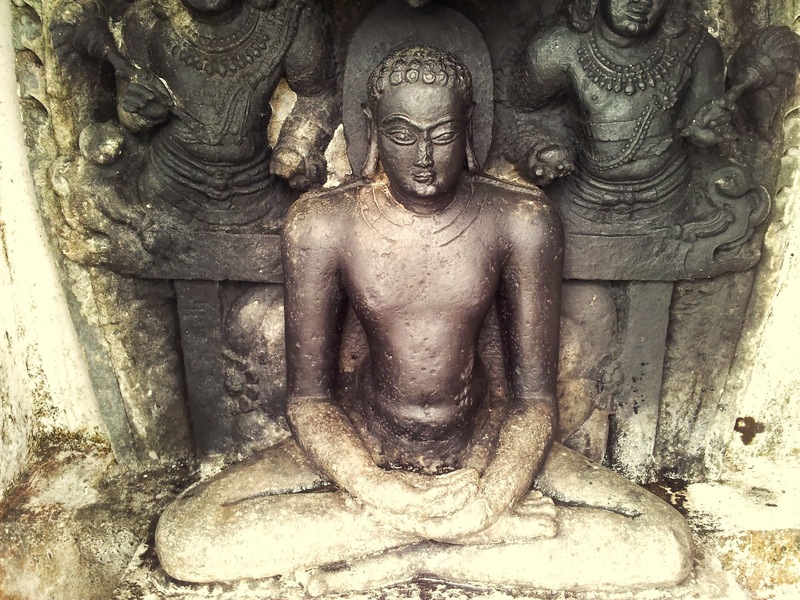 Agumbe village is in Teerthahalli taluk of Shimoga district and is situated at 2,710 ft high from sea level . Agumbe is also famous for Doordarshan T.V. serial called as “Malgudi Days”, which was directed by Shankar Nag and is based on the novels written by R.K.Narayan. 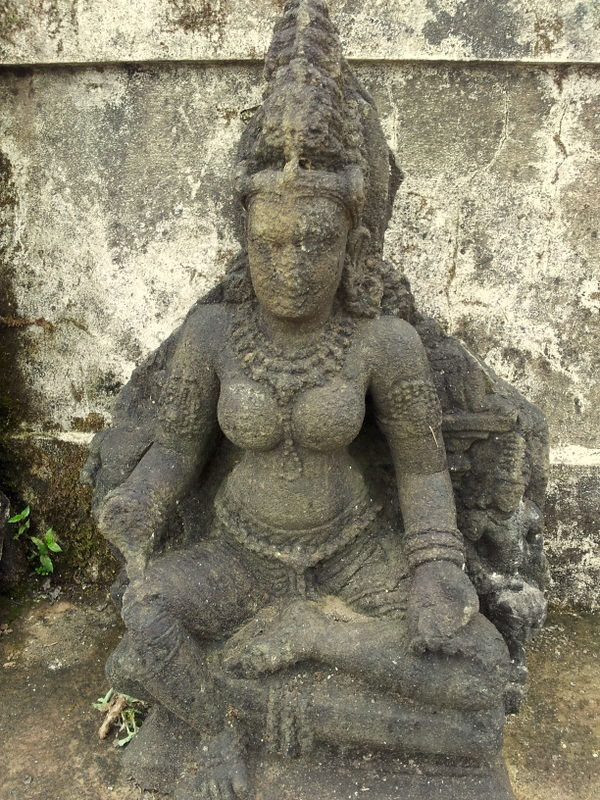 Many episodes of this serial were filmed in Agumbe in 1985. Those who have viewed this Doordarshan TV serial, they will never forget this village and the old majestic & magnificent ancestral house in Agumbe, where the movie was shot. In fact, Agumbe Ghat lies in the range of Western Ghats. The range of western Ghats starts near the border of Gujarat and runs approximately 1,600 km through the states of Gujarat, Maharashtra, Goa, Karnataka, Kerala, Tamil Nadu and ends at Kanayakumari, which is at the southern tip of India. 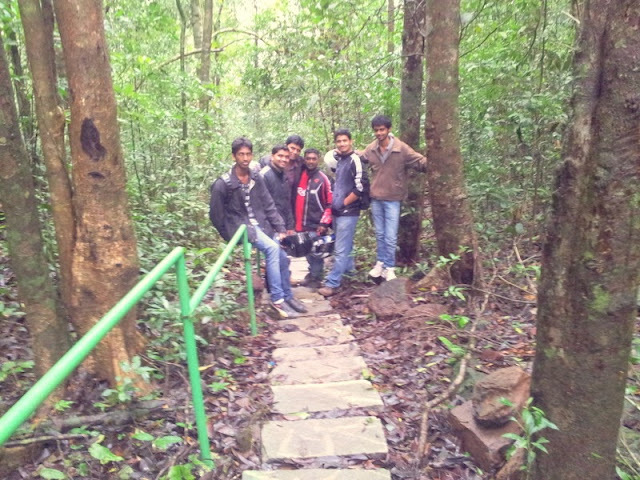 At Agumbe village there is a research centre called as Agumbe Rainforest Research Station (ARRS). It’s a permanent rainforest research station in India which was established by herpetologist, Romulus Whitaker. 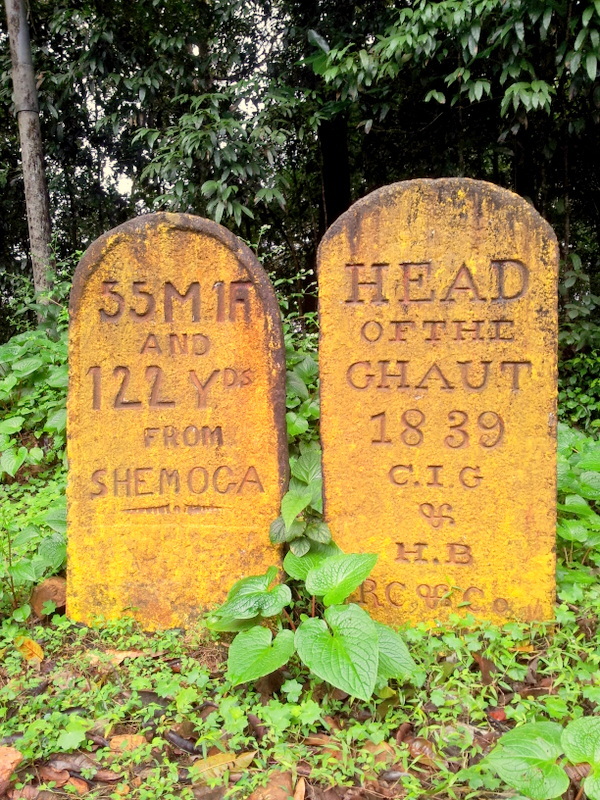 Whitaker chose Agumbe as the location for this station since this was the place where he spotted his first King Cobra in the early 1970s. The main goal of the research station is to study and conserve the rainforests of South India, using King Cobra as the flagship species. One of the main goals of this research is to establish the world’s first King Cobra Sanctuary also. Agumbe Ghat is also home for the “Lion Tailed Macaque”,declared as one of the species of the monkeys as well as “ Malabar Horn Bill” bird, that too is at the verge of getting extinct. 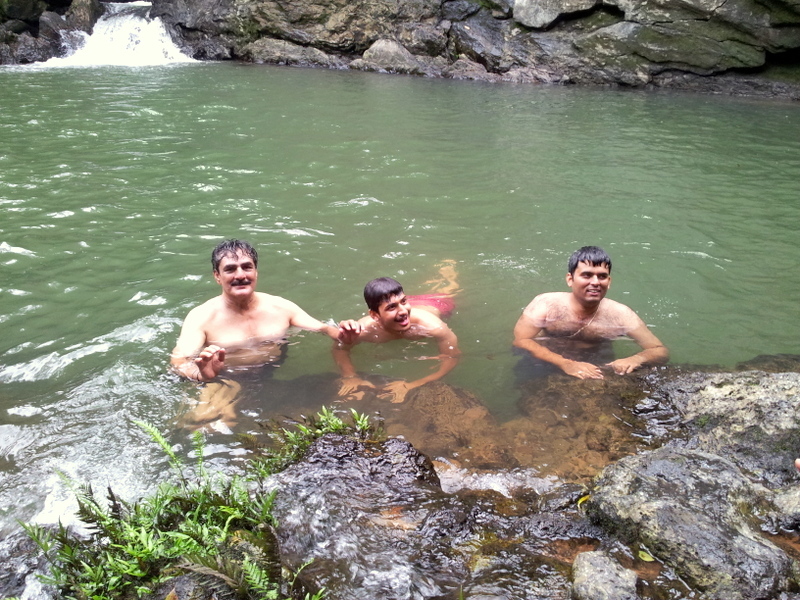 Later at Agumbe village, we went to Agumbe Police Station to take permission to visit Jogi Gundi waterfalls, Barkana waterfalls and Nishhane Gudde. Because of the naxalites menace, now a days its compulsory to take permission from the police station. 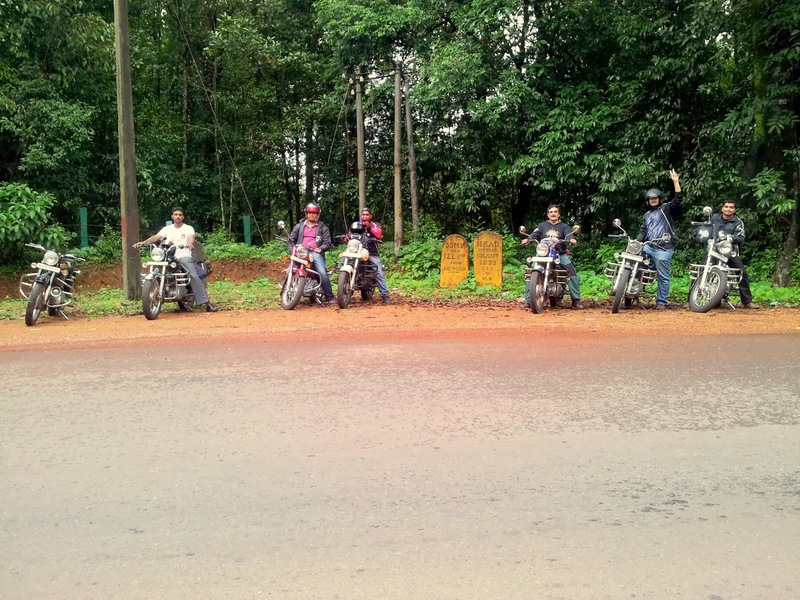 Since 2005, Naxalite activity has been occasionally observed near Agumbe and hence check posts are created at all intersections. 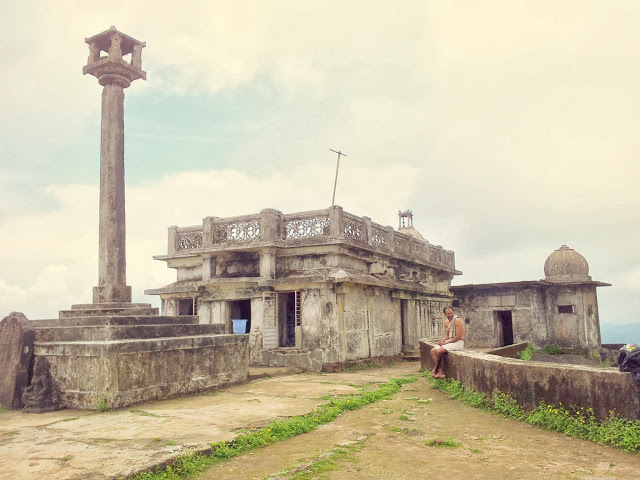 This however has neither hindered the natural beauty of Agumbe and its surroundings, nor has it dampened the enthusiasm of exploring by nature lovers. At the police station we wrote our names, addresses and contact numbers and then we were granted the permission to go to ONLY Jogi Gundi waterfalls and we were forbidden to go to Barkana or Nishan Gudde, because of the naxalites menace. 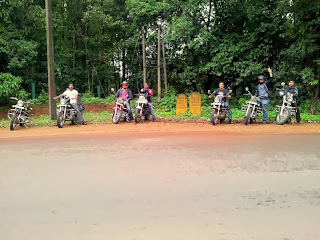 From Agumbe village, to reach Jogi Gundi falls, we rode nearly for 0.5 Km, the very first right turn on the Sringeri road, there is a faded sign board written in Kanada Language reading and showing arrow direction to Barkana. we need to take this very right turn. We rode for 3 to 4 KM through the tar road and then once again we took a right turn, where at the entrance we had to pay Rs.5/- per person as entry ticket to Jogi gundi waterfalls. there is a stretch of the small road which takes us right up to the cement prefabricated steps, those steps leads us directly up to the edge of the waterfall. On the way of this small stretch there was a big log of a fallen tree which blocked our way to ride further with the motorbikes. 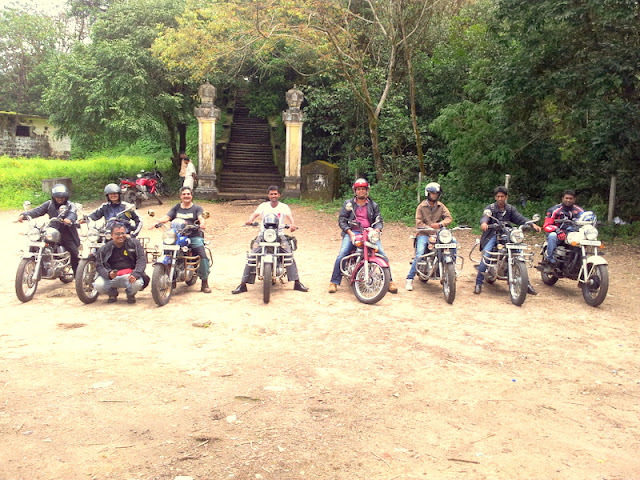 Finally we left our motorbikes there itself and trekked a small distance to reach the cement steps. Luckily none of us got sucked by leeches. Though we had carried a paste of coconut oil and snuff mixed, to prevent ourselves from leech bites. 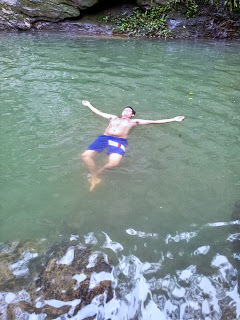 Even though, it is very small waterfall of about 20 feet height and is more than 15 feet deep. 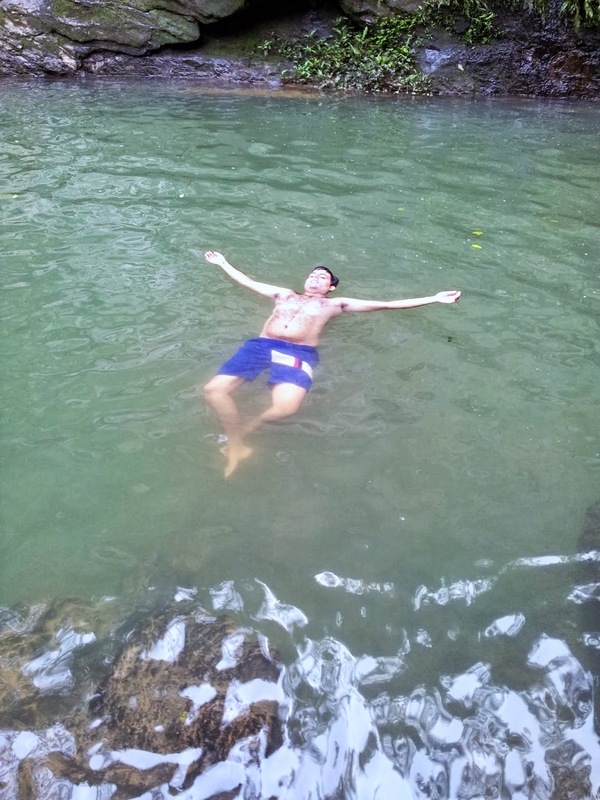 It’s a very cool and serene place with clear blue water cascading down and is a pleasure to swim in it. After swimming and playing in cold water, we felt fresh, great and all our fatigues just vanished. 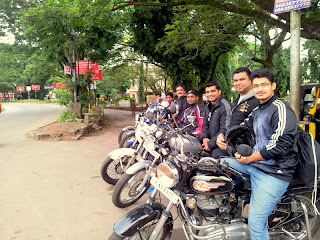 After having fun at Jogi Gundi waterfall, we rode on Shingeri road and then after 6 to 7 Km. we took a felt turn that road leads straight to Kundadari Betta. The distance from Jogi Gundi to Kundadari Batte is approximately 15 to 16 Km. 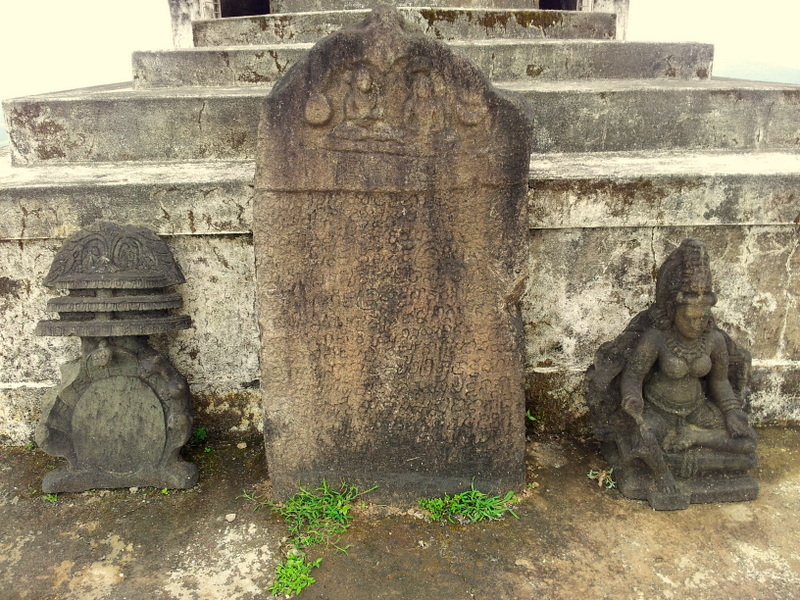 Kundadri hill lies in the Theerthahalli Taluq of Shimoga district of Karnataka. Lying at an altitude of 3,200 feet above sea level, The summit offers a spectacular panoramic view of the surrounding region. 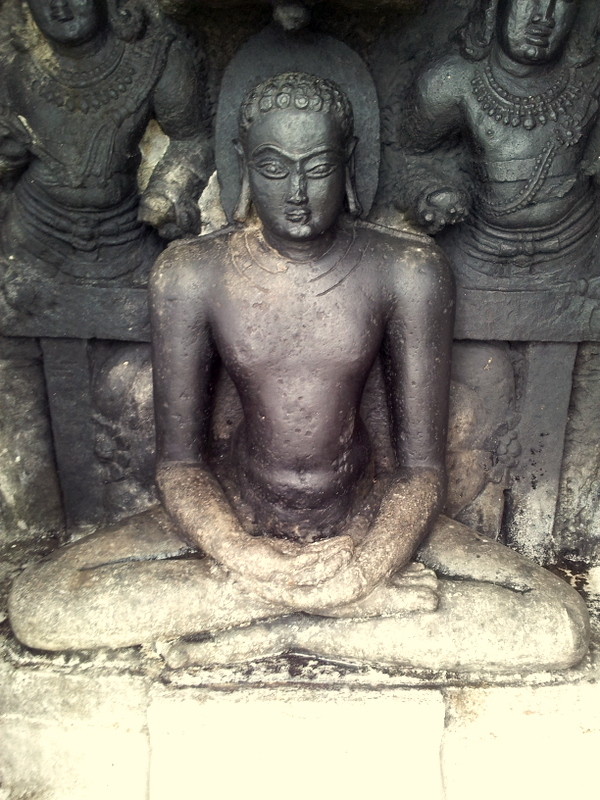 Kundadri hill is home to a Jain temple built during seventeenth centaury. 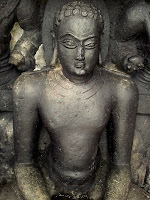 During the eve of Makara Sankranti, Jain pilgrims gather at the hill top in large numbers to offer prayers. 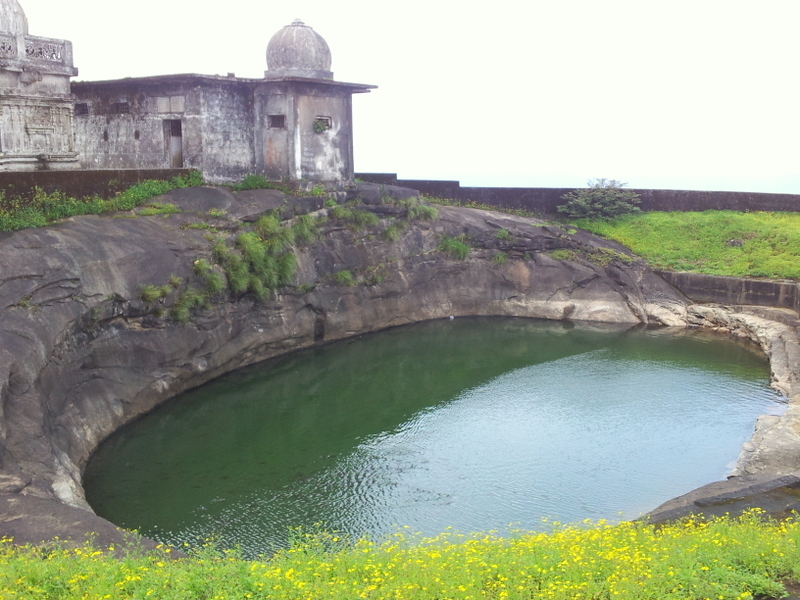 The temple premises also has a pond. Kundadri hill is actually a huge monolith with vegetation cover. 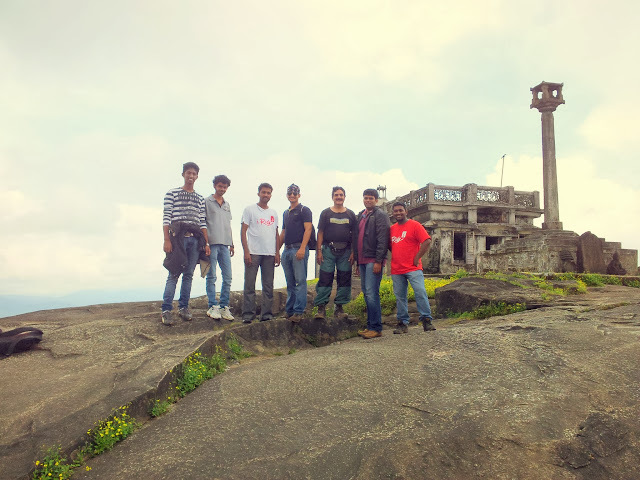 The view from Kundadri hill is excellent and on a clear sunny day, sunsets at Arabian sea can be spotted. 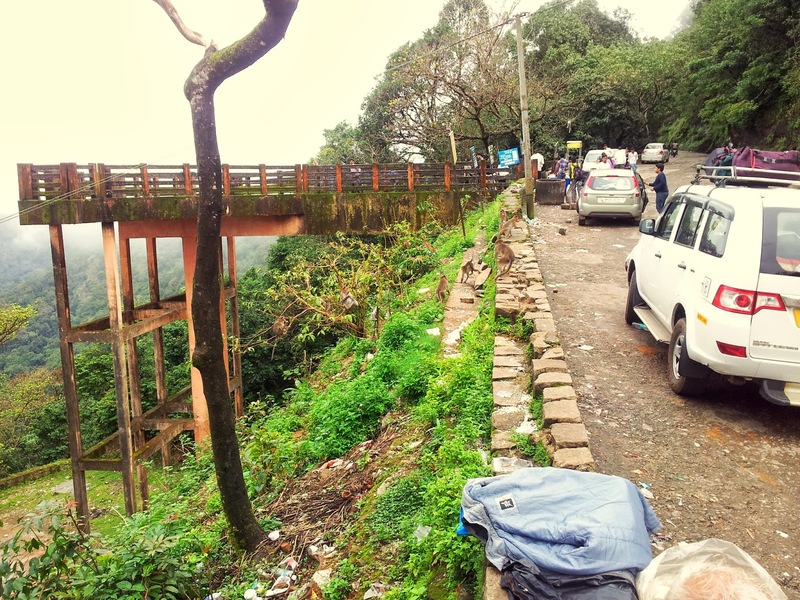 For cars and motorbikes to go upto hill top, there is a very narrow and steep tar road and for trekking adventure enthusiasts, there is a 3 Km. trek trail from the base to the top. Here at Kundadari Betta, as expected two more URU club members SAKSHAR and JAIRAM joined us. 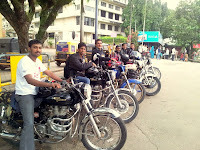 Since, they were ridding all the way from Mangalore, so they preferred to come through the short route to Kundadari Betta itself. It was pleasure meeting them. Then in the afternoon, ten of us rode back towards Hebri via Agumbe. At Hebri we had late lunch at Kubera restaurant. 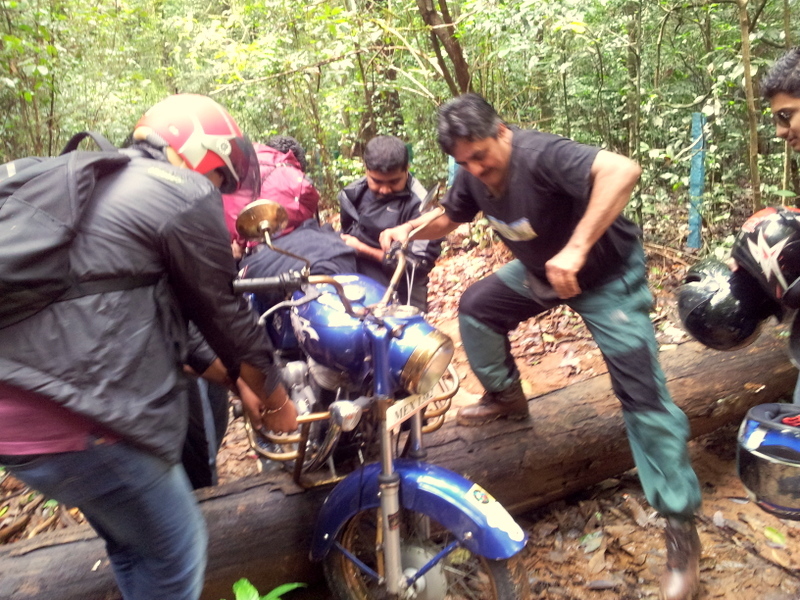 It was a great trip that too without any motorbikes break down. Then each of us took separate routes to each ones home. Thank God all of us reached safe to our respective homes. Great write up with eye pleasing snaps...The snap of Kundadri hill is mind blowing.I am a great fan of photography if not anything else. It brought back fond memories of our walk to it in last Monsoon. Alas the peace was ruined by drinkers who made sure the place left their garbage mark and chaos. Hope it is litter free now, least to expect in paradise. Love and respect for nature should be paramount for the well being of all. Keep up the good job. 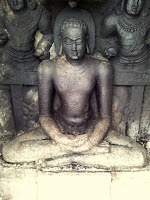 Thank you Rakesh for helping me to create my blogg. I know I have yet to learn more, but for first timer, small mistakes are permitted. With you to help me, I am sure to improve. Say my special thanks to your wife for allowing me to take your time. This time strangely there was no litter at Kundadari hill top. Once again thanks to you for everything. Whoever you are,thank you for appreciating my blog narrations. I learn many good things in your company.... Courtesy costs nothing but brings everything. We can if we decide we can.... and alike. Quite encouraging write up. This is the first visit to your blog. I got a new plateau of fresh tulips to blossom. Keep writing and be happy.